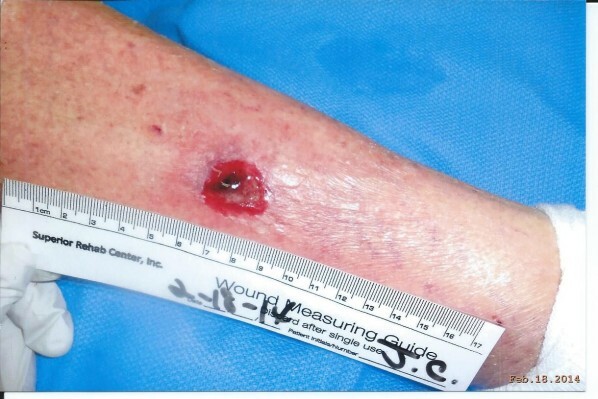 Leg Wound, Clinical Case Study by: Jean O. Galloway, PT-Superior Rehab Center Newport Beach, CA. Mr. C. is a 75 year old male who sustained an injury to his left leg while getting out of a boat. Mr. C. Is active and alert with no other major medical issues. First Saw patient on 2/18/2014 (See photo below). Wound measured 2.2 x 1.5. Tissue color was red/black. Patient had incurred the injury approximately 3 weeks prior to being referred here as he thought he could care for it himself. He was using Neosporin and Band-aids. Top skin of wound was still in a small pile in center of wound and had never been removed. I debried wound and applied Anasept Gel. 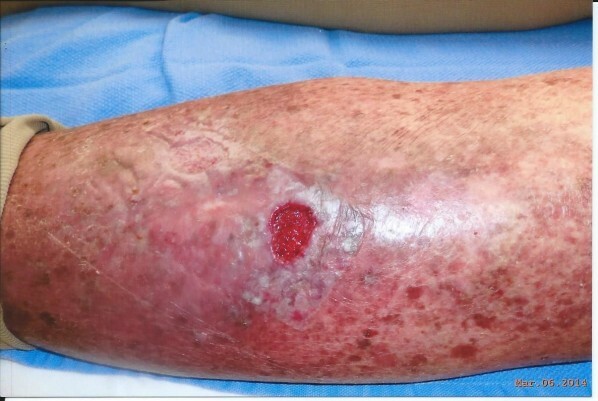 Wound was covered with Telfa and Island Barrier Dressing. Anasept cleanser was used before and after debriding and that protocol continues. 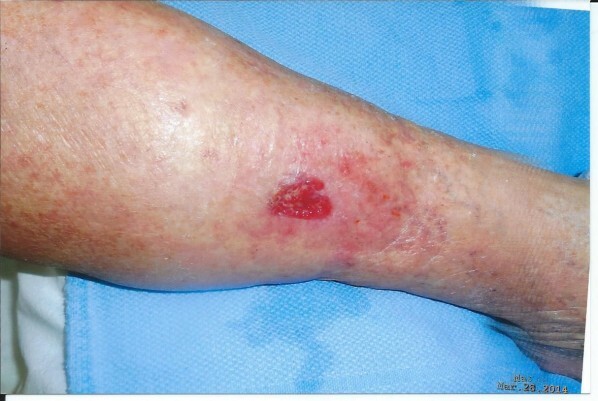 Patient seen twice weekly with Anasept Gel continually being used under Telfa and Island Barrier Dressing. New photo taken on 3/6/2014 (see photo below) showing progress. Wound now measured 2.0 x 1.5. Patient pleased with results to date. New photo taken once again on 3/28/2014 (see photo below). Wound now measuring 1.5 x 2.0. Progressively getting smaller with good red granulation. Patient pain level had decreased considerably and encouraged by the results to date. I am very pleased with the results I am receiving from using Anasept Gel and will continue until wound closure. 2/18/2014. First patient visit. Wound measured 2.2 x 1.5.